Travel in Indianapolis is best done by car, on account of the very limited public transport service. However, roads around Indianapolis are renowned for being confusing and visitors are advised to plan their journeys with maps well in advance. 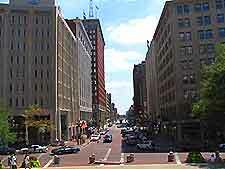 Travel in and out of Indianapolis city is easier and can be managed by road, rail or air. Indianapolis International Airport is a single terminal construction offering largely internal flights. The airport is small and consequently deals with a limited volume of traffic. Despite its size, Indianapolis International Airport does offer a reasonable array of facilities, plenty of parking spaces and a number of ground transport options. View our Indianapolis Airport Information travel page for further information about Indianapolis Airport. 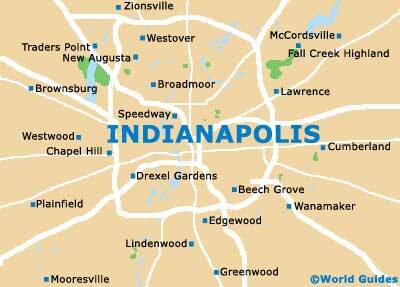 Hire cars in Indianapolis can be obtained from either the airport or in the city itself. The city's main highways are the I-69, I-70, I-74, I-65 and I-465. Parking facilities in the city are good, while many residents will tell you that downtown Indianapolis is small enough to travel around on foot, making a car optional. Book your Indianapolis Car Rental here. 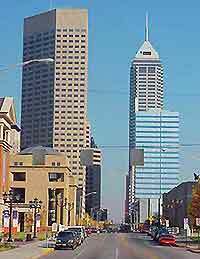 The airport bus service (IndyGo) provides regular travel from the airport's main entrance to downtown Indianapolis, while Greyhound bus company runs many services, which travel to and from other major US cities. Meanwhile, the public bus service in Indianapolis has a reputation for being infrequent and unreliable, and may not be the best choice of transport if you are running on a tight schedule. There are no trains operating within the city itself, although Amtrak runs services from Indianapolis to a number of other major US destinations and vice versa. Taxis are not really necessary for getting around the downtown area, as its compact nature makes the district easily explored on foot. However, if you intend to travel farther afield, Indianapolis taxis can be a convenient means of getting to your destination. Unlike other US cities, there is no hail and ride service in Indianapolis, so you will need to call a reputable taxi firm ahead of schedule to arrange collection from your point of embarkation.